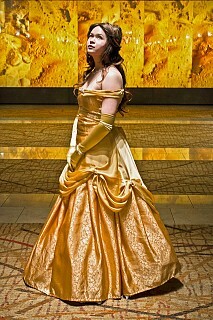 I used a gold brocade and a thin satin that was a similar shade of gold. The brocade underskirt is one piece that is pleated rather than gathered. The overskirt and top are one piece that zips up in the back. The overskirt is a wide A-line that was gathered and hand-sewn in place. I sewed 3 pearls to each point of the gathers. 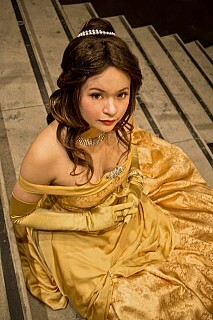 The brooch at the center front of the dress was a gift from a friend. 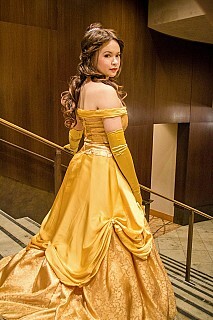 I debated making the dress large enough for a hoopskirt, but I wanted to be able to be more mobile and not get stuck on all Sakura-con's escalators so I only wore a petticoat with it. the wig is actually my Kaori Misaki wig restyled.